Robert Langdon is in a race to read us the entire text of Frommer's "Eight Nights in Rome, Venice, and Florence", and tell us everything we wished and not about Dante's Inferno. 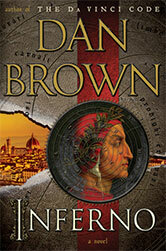 Robert Langdon is back, and the tall and handsome professor has to use his knowledge of symbology, yet, yet, yet again, to try and save the world from the diabolical plans of a now-dead billionaire who believes too many humans overpopulate the planet and therefore the only way to prevent the extinction of the human species is by, get this, killing them off, or at least most of them. Since Langdon is superhuman, and while he wears Harris tweeds and Somerset loafers instead of a blue cape and blue underwear, ordinary crises would not do. To even the scales somewhat he has to be given a handicap or two. The crisis is to stop the aforesaid madman billionaire from unleashing some sort of a biological plague on the whole world. So diabolical is the billionaire that he will leave clues inspired by Dante's Inferno, because it is not enough to just unleash an apocalyptic plague on the world - you have to convince the world of your literary credentials too, lest you be dismissed as a uncultured philistine. Just leaving a vial of the plague by the kerb on a busy street would not do I suppose. And the hero's handicap? To begin with, Langdon is running from a woman who wants to kill him - surprising, one would say, for a tall and handsome professor. He has been shot, in the head, but not too severely, obviously. He cannot remember anything from the last few days - some sort of retrograde amnesia. Yet the luminescence of his eloquence dazzles us; he has to but sagely remark, “There’s a reason evolution is a gradual process.” and the head of the WHO cannot help but experience "feeling her admiration for the professor growing with each passing moment." The leading lady in the not-so slender novel with a slender plot is slender all over - slender is a good word to use. So are sentences like this - "Tall and lissome, Dr. Brooks moved with the assertive gait of an athlete. Even in shapeless scrubs, she had a willowy elegance about..." [location 183]. For a thesaurus a plot was lost in the riptides of flowery prose prancing on the shimmering mirage of a story. The professor of religious symbology is also erudite enough about evolution, world religions and science. You cannot, however, fault the author for being partial to one religion versus the other. He manages to get things wrong in a heart-warmingly secular manner. Mind you, in Turkey and the Indian subcontinent (which would include India, Pakistan, Bangladesh, and you could also include Afghanistan in it), the Islamic call to prayer is pronounced "azaan" (आज़ान), but the book writes, "haunting intonations of the adhān, the call to prayer" - in Istanbul. Let's balance this contretemps with one from the other side, Hinduism. Sample this: “ ‘I am death’?” Sienna asked, looking troubled. “That’s what it said, yes.” “Okay … I guess that beats ‘I am Vishnu, destroyer of worlds.’ ”The young woman had just quoted Robert Oppenheimer at the moment he tested the first atomic bomb..." [location 724]. Never mind that the line is, "Now I am become Death, the destroyer of worlds." and were spoken by Krishna, not Vishnu. You the mortal and very ordinary reader has to plod through more than two hundred pages before the outlines of a plot start to reveal themselves, only to get lost somewhere between Florence and Venice. What you are rewarded with, however, is a free backpacker's guide to these two beautiful cities. The plot has to make do lugging along in economy class, without any meal or nourishment, which explains its emaciated state throughout the book.